– I know the subject inside out. Well, it’s precisely because you do have so much knowledge on the subject that you should have media training. When a rather unexpected question is posed in an interview that co uld be as short as a 30-second soundbite, you’ll struggle to distil that knowledge to find the right answer. – I’m never going to go on Watchdog or Newsnight. Maybe not, but there are thousands of consumer or trade magazines, local TV stations and newspapers, as well as websites, that you could be talking to and they can all help raise the profile of your business. – The journalist will write what they want anyway, regardless of what I say. Some might, but only if you give them the “ammunition”. It’s far easier for them to do this in a print interview, but good training can show you how to avoid this. It’s why, unlike many media training companies, we ensure delegates do a print interview scenario, which is written up into a mock article and given to you with feedback on the day. – I’m too busy building the business. Talking to the media can actually be one of the best ways to do this – think how many thousands of people you can reach in an interview that may last under five minutes….and the airtime/column inches won’t cost you a penny! – We have a press office/public relations person to do that. Journalists would always rather get the information from the person at the heart of the story – the finance director, the CEO, a nurse on shift, a teacher in class, a chef in the kitchen etc.., rather than the company’s press person. – I am that press officer/PR person, so journalists don’t want to talk to me. 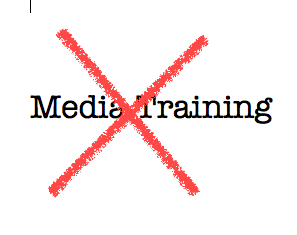 That’s often the case, as we’ve just said, but it’s still worth having media training, especially if you’ve not previously worked as a journalist, so you understand what support and skills your spokespeople need and what “tricks of the trade” they can expect a journalist to use. – The boss always does the interviews. Maybe, but imagine if your database is hacked or one of your trucks crashes, or a member of staff is arrested….just when the boss is on holiday/sick leave/maternity leave or doing jury service. A reputation that’s taken years to create could be lost in minutes, thanks to a deafening silence from your company. – I’ll stumble over my words and mess things up. The media don’t expect you to be word-perfect or sound “scripted”. Occasional “ums” and “aahs” are all part of normal conversation and, above all, we want you to “speak human”. Excessive, distracting hesitation usually only creeps in when you’re unsure of your messages – and that’s what good training helps you avoid. – I don’t want to sound like some politicians do. You won’t, because we don’t teach you to ignore a question; we’ll teach you to handle the trickiest of enquiries and then talk about what matters to you and your business – and, crucially, what matters to the audience. – I’ve done media training already, so I’m fine. We’ve run marathons, but we wouldn’t consider doing another one without more training. Talking to the media is not “rocket science”, but it is a skill that should be refreshed and practised.